The month of August was quite exciting for the Asia Injury Prevention (AIP) Foundation. We publicly announced at a stakeholder workshop our new project to increase passenger helmet use in Cambodia called “Head Safe. Helmet On.” Supported by USAID, the two-year project will directly benefit 222,445 Cambodians through the distribution of helmets and road safety education. The same month, Cambodia’s Council of Ministers approved a draft traffic law, which includes compulsory motorcycle helmet use for all passengers, including children. At the moment, legislative approval is still needed by the National Assembly for its passage into law. We are encouraged to see advocacy efforts leading toward change, and are excited that “Head Safe. Helmet On.” is being implemented at such a crucial time in Cambodia. Please see below to read more on AIP Foundation’s activities and achievements throughout the month. Hanoi police to check quality of bike helmets—The Hanoi People’s Committee has asked the municipal Traffic Safety Committee to conduct a helmet inspection campaign alongside local police. Inspectors will check trading certificates, bills, and receipts belonging to helmet vendors and importers, and examine working conditions and trademark ownership at helmet manufacturing enterprises. They will also test various helmets to ensure their safety. The Product Quality Management Department under the Ministry of Science and Technology inspected nearly 80 helmet manufacturing and trading enterprises in 12 provinces and cities in the first six months of this year. Out of more than 300 helmet samples, 46 failed to satisfy quality and trademark regulations. 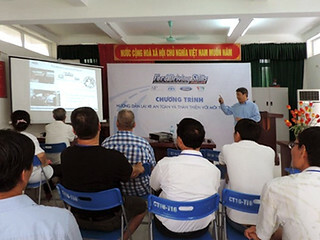 In partnership with Ford Vietnam, AIP Foundation supported Ford’s Driving Skills for Life (DSFL) training program conducted for two days in Hanoi. The DSFL program aims to address risky driver behavior in order to improve the safety of other vulnerable road users: pedestrians, motorcyclists, and bicyclists. 30-40 trainees attended each session, including taxi drivers, community members, representatives from the Hanoi Transportation Association, and AIP Foundation partners. Participants commented that the practical training was very valuable for their everyday duties and that they learned new driving skills during the training. For more information on the DSFL program, click here. On 12 August, 2014, Australian Ambassador Hugh Borrowman visited the Asia Injury Prevention (AIP) Foundation and the Protec Tropical Helmet Factory in Soc Son, Hanoi. “The Foundation has made great contributions to road traffic safety in Vietnam over the last 15 years, from their advocacy work, to educating children on traffic safety, to the development and production of the helmets themselves,” said the Ambassador. Owned by AIP Foundation, the Protec Tropical Helmet Factory manufactures high-quality, affordable helmets with a light-weight design, appropriate for tropical climates. Currently, there are 150 employees working in the factory – one third of whom have a disability. 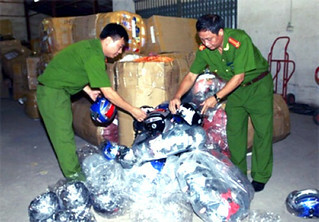 The Australian Government was a supporter of the Foundation’s National Helmet Wearing Campaign from 2007-2009, and has supported eight Australian volunteers to work in the organization. To read more, view the Australia in Vietnam Facebook page. Throughout July and August, AIP Foundation conducted a pilot safety project involving school- and community-based Road Safety Days, organized under Nghi Son Refinery and Petrochemical LLC (NSRP) in the Nghi Son Economic Zone. The NSRP Traffic Safety Pilot Project is designed to reduce the number of road crashes and prevent traffic-related deaths and injuries in Mai Lam, Hai Thuong, and Tan Truong communes. 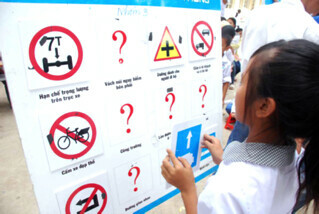 School-based Road Safety Days were held at six schools (primary and secondary) in the three communes of Mai Lam, Hai Thuong, and Tan Truong. These events bring important road safety messages to students through activities such as helmet painting, bicycle games, traffic sign puzzles, and safe road user activities. Three community-based Road Safety Day events were also held in the three communes to address road safety behavior among the public. These community events—some with over 400 in attendance—included motorcycle driver safety training courses and road safety speeches. NSRP is a US$9 billion joint venture of PetroVietnam (PVN), the Japanese companies Idemitsu Kosan Co., Ltd. (Idemitsu) and Mitsui Chemicals Inc. (Mitsui), and Kuwait Petroleum International (KPI). This largest oil refinery in Vietnam is located in the Nghi Son Economic Zone in Tinh Gia district, Thanh Hoa Province, and is under construction phase, with operational phase expected to commence in late 2017. The pilot project is the first step in NSRP’s efforts to help communities be safe on the road. NSRP is the first industrial project in Tinh Gia District in Vietnam caring about safety through community investment programs. AIP Foundation hopes that the model will spread throughout Vietnam. In an effort to increase road safety awareness before the beginning of summer vacation, 500 students from target schools at Hun Sen Preak Russey, Korki, and Vorsar Primary Schools in Kandal and Kompong Speu provinces participated in organized road safety activities sponsored by The UPS Foundation this month. Students were informed on the fundamentals of road safety, including traffic law adherence and correct helmet use, through different extracurricular activities. 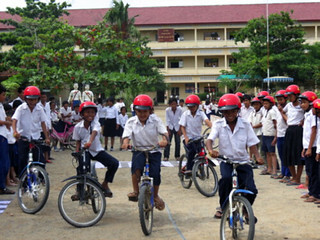 Students enjoyed educational games such as pedestrian lessons, bicyclist safety training, road safety ping-pong, bicycle riding games, and question and answer activities to emphasize the importance of helmet use. In April of this year, for example, observations at Vorsar Primary School found the percentage of students on motorcycles who were wearing helmets to be 0 percent. Observations were taken again this July and 67 percent of students on motorcycles were wearing helmets. These educational methods reinforce safe road behaviors prior to the start of summer vacation, when students spend more time outside and are more at risk of injuries from road crashes.